$40.00 for brunch??? To some, that might sound like a raw deal. The venerable AYCE brunch is a hotel staple. 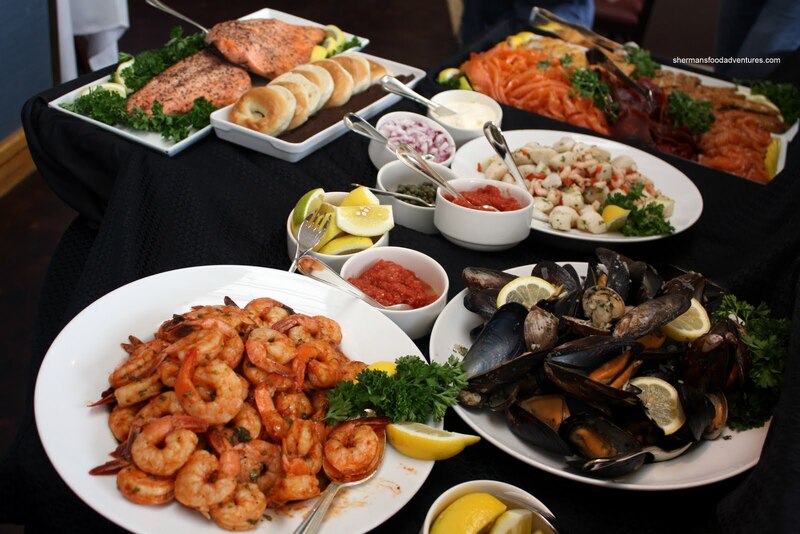 The elaborate spread usually follows the formula of cold food, breakfast items, hot entrees, omelet station, meat carving station and desserts. Naturally, some items hold up better in this environment more than others. The question is: can we actually eat $40.00 worth of food? It is possible while it is probably not a good idea. At the Pan Pacific, the AYCE brunch tops out at $50.00 per person. 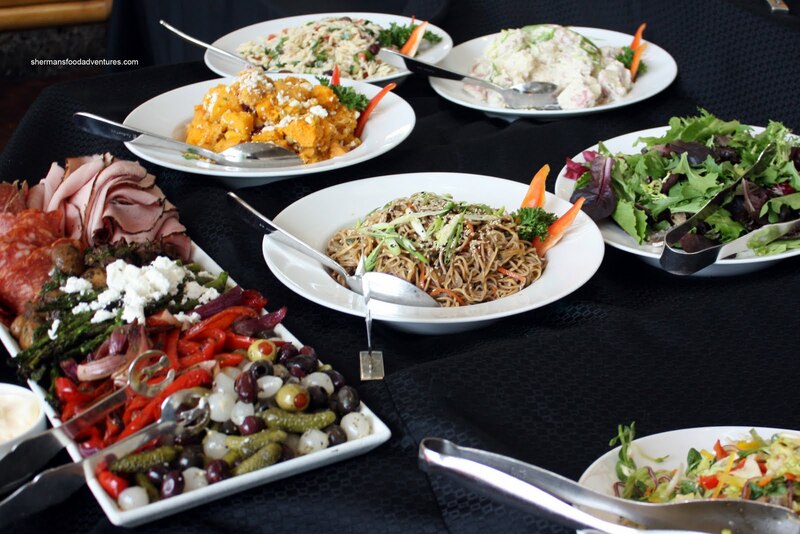 Good food for a buffet, not necessarily worth it unless you take in account the location, level of service and ambiance. So far, we've been to the Hotel Vancouver, Metrotown Hilton and the aforementioned Pan Pacific. 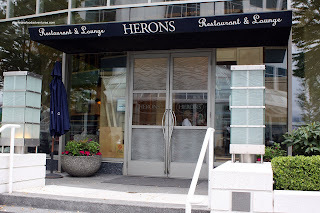 Today, we sample another Fairmont property - the Waterfront Hotel (specifically Heron's Restaurant). One thing that we must take into account when dining anywhere in Downtown is the cost of parking. The metered parking, if you can find one, is a hefty $2.00 for 30 minutes. Thus, we decided to park at the Terminal City parkade a block away for $7.00 (for the whole day Sunday). I origina lly made a reservation via Opentable a few weeks back. We arrived a bit early and after checking into the front desk, we sat and waited to be seated. For some inexplicable reason, we were the last to be seated, even though we were the second party to arrive. I must've counted 5 other parties being seated before us. No big deal since there was plenty of food and plenty of tables. But why make a reservation when people who just walk up after we arrive, get seated first? We got no apology or explanation for this and I felt that this was quite unprofessional. Ultimately, we were left quite confused as to their seating system (when you are willing to pay $40.00pp for a meal, this should not happen, ever...). 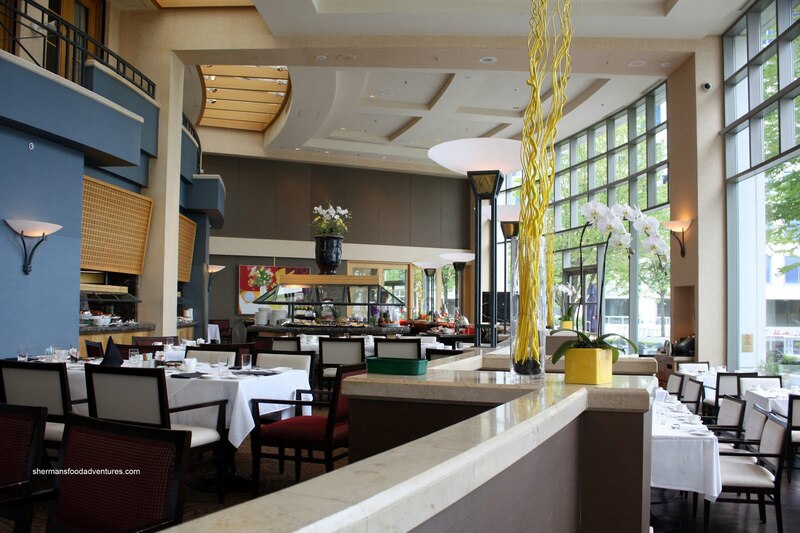 Fortunately, once we were seated, our server was extremely personable and friendly. She responded to all of requests promptly and professionally. Moreover, she was observant enough to offer my parents a senior discount which brought their meals down to $33.00. I quickly rushed to get some pictures of the barely touched food. I say barely touched because the people who were seated before us started eating already. Yes, the real reason we arrived early was to be seated first so I could take pictures of the pristine food. Too bad really, we weren't seated first! Okay, I'll stop talking about it, I'm over it (well, maybe not...). After some mad picture-taking, I got down to business - eating! As usual, there are selection of Salads, Cold Cuts and Marinated Vegetables. 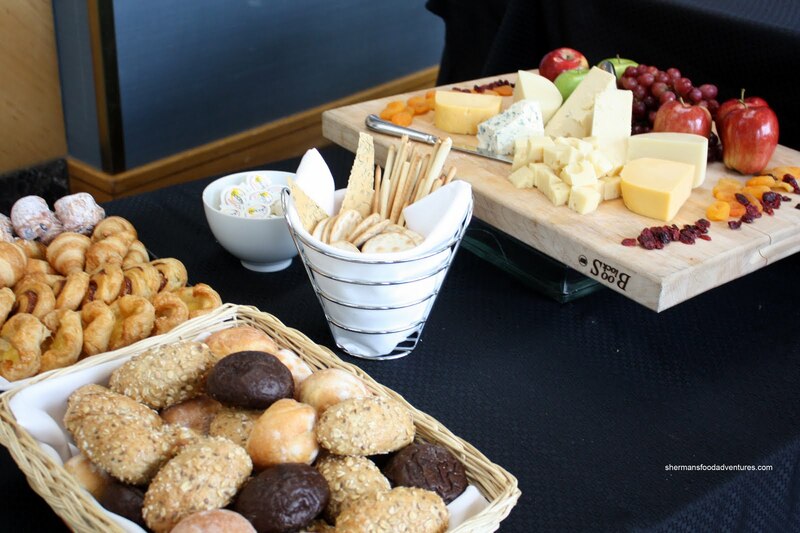 To the left are the Breads, Pastries and Cheeses. To the right, is a variety of Fresh Cut Fruit and Veggies which include the usual cantaloupe, honeydew, pineapple, watermelon, grapes, strawberries, carrots, cucumbers, cherry tomatoes, peppers and celery. On the opposite side were the money items. 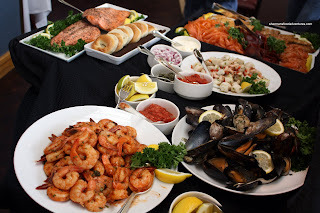 A nice spread of Seafood lay waiting which included prawns, mussels & clams, scallop & shrimp ceviche, smoked salmon, gravlax, smoked herring and Indian candy. I really enjoyed the plump mussels, they were fresh tasting and sweet. The prawns were also very good with a nice snappy crunch. 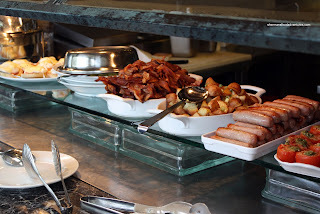 There are are 2 Hot Food Stations with the first consisting of the all the regular breakfast items such as Eggs Benedict, Pancakes, French Toast, Bacon, Potatoes, Sausage and Tomato au Gratin. Although the Eggs Benedict were sitting under a heat lamp, the free-range eggs were poached perfectly with a nice runny yolk. I found the Hollandaise to be a bit bland though, a little more lemon would've helped. The other items were pretty much your decent standard breakfast fare. The adjacent station included Butter Chicken, Grilled Chicken Thighs with Peppers, Spring Salmon with Buerre Blanc, Leg of Lamb with Olives & Sundried Tomato, Truffled Mushroom Ravioli, Veggie Chow Mein, Shanghai Bak Choy with Shiitake Mushrooms and Carrot & Ginger Soup. I found that it was more like tomato chicken rather than butter chicken. It was quite tart and not creamy at all. Despite being cooked until well-do ne, I did like the lamb. I personally like the taste of lamb and it was evident while still taking on some of the flavourings. 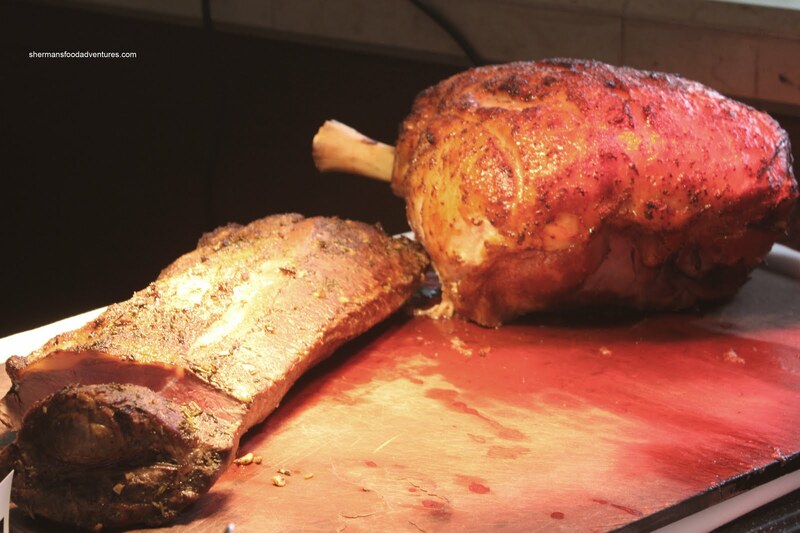 Over at the Carving Station, there was roasted Ham and Beef Strip Loin. I was disappointed that there was no prime rib; but decided to give the strip loin a try. Nope, no good. The darn thing was cooked completely through (to satisfy the masses) and it was tough to eat. What a waste of a strip loin roast. Viv had the ham, which was tender; yet quite salty. The standard omelet bar was directly beside the meats and I didn't bother with it since there were no premium ingredients. For me, if I ate a whole omelet, that would be too filling. Besides, the Chinese in me drew me towards the seafood, again and again... To the right of the carving station was an area dedicated to the kiddies. There were items such as Pizza, Chicken Strips, Fries, Sandwiches, Cookies, Fruit Cups, Mini-Chocolate Bars and Veggies. And right next to that, there was a selection of Sushi and Chinese Dim Sum (Spring Rolls, Haw Gow, Sui Mai, Fried Dumplings). These items are mainly there to up the diversity quotient, not necessarily to be representative of the actual cuisine. One could easily get better quality Sushi and Dim Sum elsewhere. 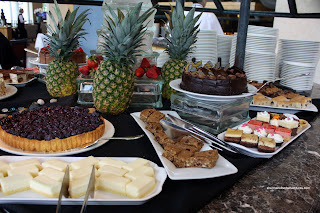 Finally, there was a large Dessert Station right in the middle of the buffet. Curiously and to my mom's dismay, there was no creme caramel. 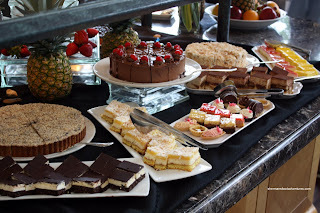 But other than that, there was a wide variety of cakes, bars and tarts. 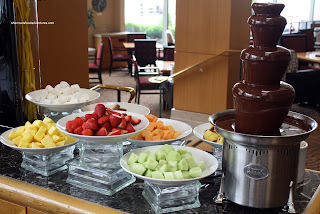 As if we thought that would be the only dessert around, there was also a Chocolate Fountain near the front entrance. This was a big hit with the kiddies. However, my son only ate the marshmallows, he doesn't eat fruit, among other things. Too bad, since the selection here at the Heron's Sunday brunch is pretty extensive. Other than the Pan Pacific, this probably has the most selection of food for the $40.00 price range. Naturally, being a buffet, not all of it turned out to be good. However, there were enough good items to make the experience enjoyable. We particularly liked the ambiance and the service (other than the delay seating us), despite the tight seating arrangements. 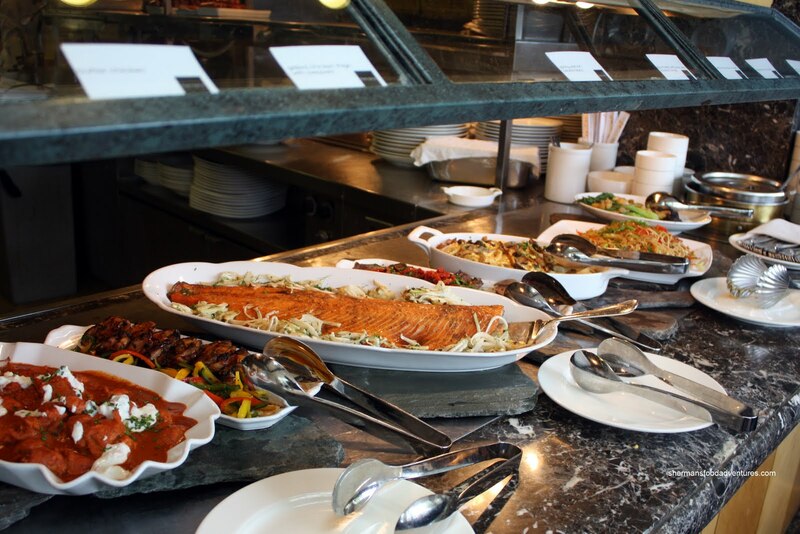 By virtue of being a Fairmont property like the Hotel Vancouver, the buffets are similar. But due to the excellent prime rib, I give the edge to Griffin's. WOW... places like this make me wish i was... ummm... fatter? LOL. i always want to do things like this but i really can't eat very much in one go. i would eat some cheese, a couple of mussels... and be full. but then, of course... i'd have to head straight to the dessert table and eat one of everything until i was ready to burst!